Greater share: The Reliance GeneMedix office. Mumbai: Reliance Life Sciences Pvt Ltd, a biotechnology and pharmaceuticals company owned by Reliance Industries Ltdpromoter Mukesh Ambani and his family, has increased its equity holding in its UK-based listed subsidiary Reliance GeneMedix Plc to 79.58% from 74%. This has been done by converting 34,777,032 warrants issued by GeneMedix Plc in 2007. Reliance Life acquired GeneMedix, a UK-based biotechnology company listed on the London and Singapore stock exchanges in January 2007, and renamed it Reliance GeneMedix. As per the terms of the acquisition deal, Reliance Life can raise its shareholding in the UK company up to 86.86%, but it is not known whether there is any time frame for raising the stake. Reliance Life’s chief executive officer K.V. Subramaniam could not be contacted on Wednesday. The cost of conversion of warrants into equity is £4.34 million (Rs 32.2 crore) for Reliance Life, at 12.5 pence per share, said a statement filed by Reliance GeneMedix at the London Stock Exchange last week. GeneMedix was the first overseas acquisition of a listed biopharmaceutical firm by an Indian company. The acquisition was by way of subscription to 1,168 million additional equity shares representing 74% equity holding of GeneMedix at a valuation of £14.6 million. The deal also offered Reliance Life the manufacturing facility of GeneMedix for production of these biopharmaceuticals for clinical trials as well as initial market entry requirements. GeneMedix had a cell culture manufacturing facility located at Tullamore in Ireland but it closed down the unit in August. In the first half of the current fiscal, Reliance Life had invested about £3.5 million in GeneMedix. This investment is currently treated as a loan from the Indian company repayable in 2014 at an annual interest of 7%, the company said in its statement to the London Stock Exchange. 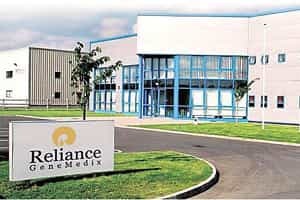 During the first six months of fiscal 2010 ending in September, Reliance GeneMedix posted an operating loss of £1.47 million. According to the statement, it was in line with the budget and its planned expenditure scheme. “The company, however, continues to exercise a strict control on costs in order to help conserve cash," said the statement. Reliance Life, one of the pioneering ventures in biotechnology and stem-cell research in India, has a wide portfolio of research activities involving plants and industrial biotechnology as well at its manufacturing and research complex located at Rabale near Mumbai. The company had plans to enter the generic pharmaceuticals business in a big way but cut the size of the project following a capital conservation strategy. It has recently introduced some products in the generic drug market locally.